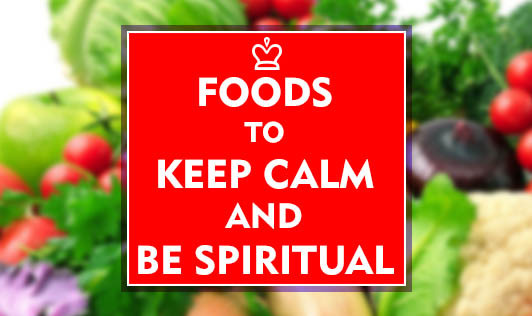 Do foods really play a role in keeping you calm and spiritual? Have you ever thought why you skip a meal when your angry or upset; why you tend to munch on chocolates when you feel depressed? Or why you over eat when you are in a tensed or even in a celebratory mood? Yes, a significant function of food apart from physical, physiological, and social development is also emotional development that decides how you can keep calm and be spiritual. As mentioned in the Bhagavath Geeta and Ayurveda, the Saatvik diet is a traditional diet to keep calm, reduce anger, maintain good cardiovascular health and blood pressure and attain spirituality. This involves consuming foods that are vegetarian, including raw foods, fresh fruits, and vegetables and avoiding processed foods or those foods that contain chemicals and fertilizers. The diet also suggests that excessive spices and foods of extreme temperatures must be avoided as a lot of body energy is utilized in bringing these foods back to a temperature suitable for digestion. Another prominent guideline that this diet pattern suggests is to restrict the consumption of extremely rich food preparations as these can cause the individual to feel restless, lazy, and fatigued. Also having food at the right time and eating a wholesome healthy breakfast each day is important to enhance concentration, attention span, and mental performance. Researches today also suggest that spicy/hot foods increase the adrenalin being pumped that in turn increases stress responses in the body as adrenalin is better known as the “fright, fight, and flight” hormone. This is also one of the reasons why most people tend to sweat while they eat such foods. Instead, this diet pattern suggests that nuts, seeds, whole grains, and oily fruits and vegetables aid in brain development. The prime principal is to practice purity in diet, physical activity, and inertia to develop interest in harmony to maintain good spiritual health and keep calm.